Lemons inspired part of this meal. I had a bunch to use, so I came up with a lemon, oregano and garlic marinade for chicken. 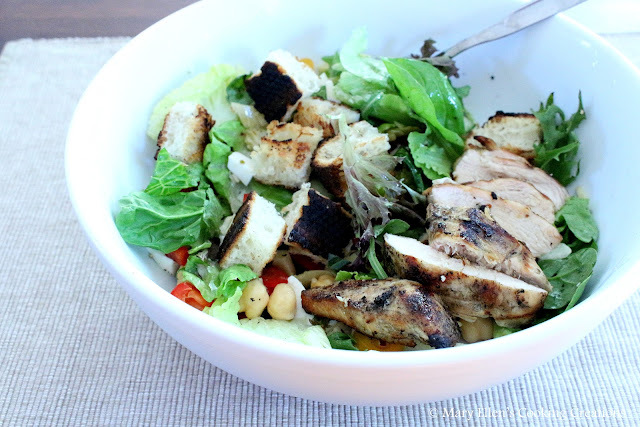 And on a 90 degree day, grilled chicken over a crisp and cold salad is the perfect dinner for me. My other inspiration came from 2 ciabatta rolls sitting on my counter. My favorite thing in a summer salad - grilled ciabatta bread. Cut a ciabatta loaf (or a roll for a smaller salad/less people), spray with olive oil and season with salt and pepper. Grill until charred to your liking and then slice into bite sized pieces. Combine all ingredients and pour over the chicken. Marinate, covered, in the fridge for at least 4-6 hours. Heat grill to high and grill chicken until internal temperature reaches 165 degrees. Let rest 5 minutes before slicing and serving over the salad. I didn't need to add dressing - the marinated artichokes, basil, salt and pepper added enough flavor.